Last year, ZTE pleaded guilty in U.S. federal court to conspiring to sell U.S. technology to Iran and North Korea, violating economic sanctions and trade export rules. The company agreed in a plea deal to pay as much as $1.2 billion in fines, fire four senior employees, and discipline 35 others — though it never did the latter. The biggest blow to ZTE came last month, however, when the U.S. Department of Commerce, citing the company’s failure to fulfill its plea deal and discipline the employees who sold components to Iran and North Korea, banned the sale of U.S.-made parts to the company for a period of seven years. ZTE was not banned from selling its products in the U.S., where it is the fourth-most popular smartphone brand, but would nonetheless have needed to immediately transform its supply chain to be able to continue to manufacture devices without U.S.-made parts. (U.S. tech makes up an estimated 25 to 30 percent of the components ZTE uses in its equipment, and the company’s smartphones run on Google’s Android operating system.) The ban, in other words, was a complete catastrophe for the company, which has asked the Commerce Department to stay the decision, and announced on Wednesday that it was shutting down “major operating activities” as a result — a presumably massive development for a company that generates about $17 billion in annual revenue. 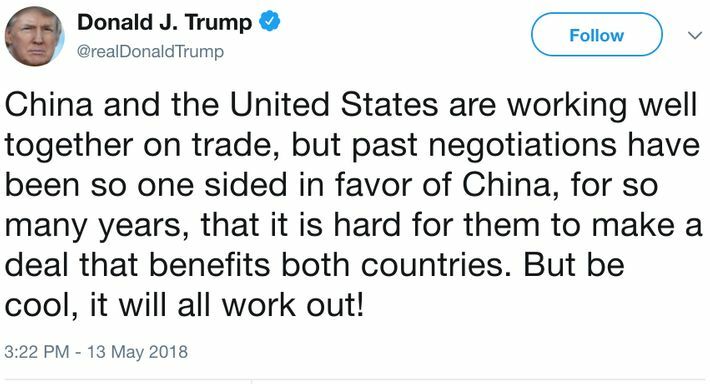 The U.S. ban has additionally been interpreted as a possible salvo in the burgeoning trade war between the Trump administration and China, and through that lens, the action may have given the U.S. leverage in trade negotiations. 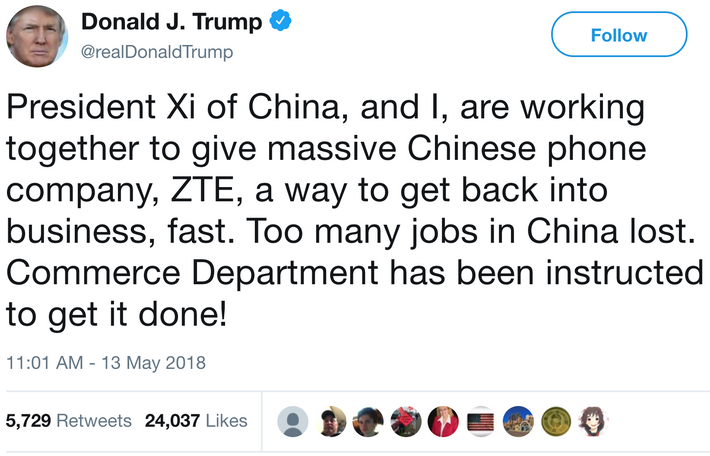 Trump now says he has instructed the Commerce Department to assist ZTE, most likely by somehow lifting the ban — though it’s not clear why, or what, if anything, the U.S. may be getting from China in return, of if the move may be in some way related to the upcoming summit with North Korea. 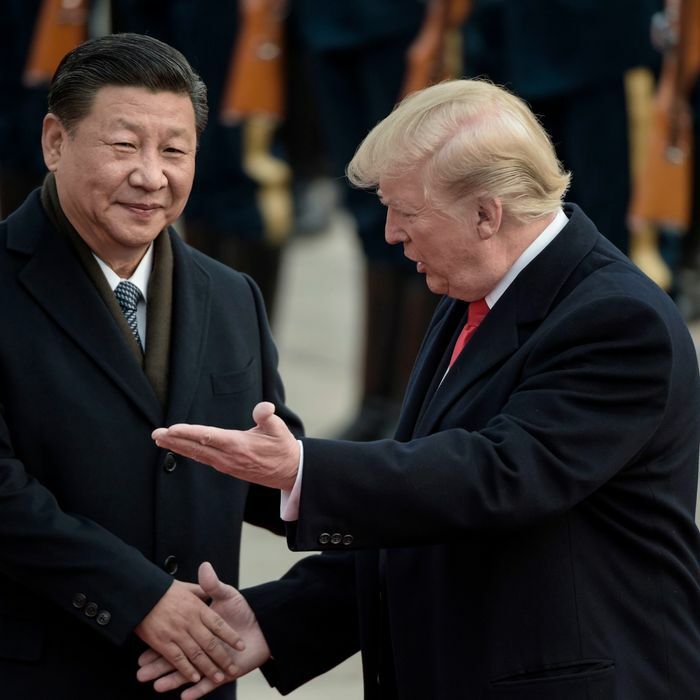 According to Axios, Treasury Secretary Steven Mnuchin and economic adviser Larry Kudlow are optimistic that a new trade deal may be reached with China over the next few weeks, and they may favor having China agree to buy billions of dollars of U.S. products — giving Trump a trade deficit win — in exchange for dropping tariffs aimed at protecting U.S. intellectual property and technology. Another Axios report indicated that trade hard-liners in the Trump administration would fight such a deal, and there seems to be some resentment of Mnuchin’s tactics amid the bitter divide. And on Sunday night the White House issued a statement that attempts to clarify his remarks — though he hasn’t deleted his tweets. This post has been updated throughout. Also, a previous version of this article incorrectly stated that ZTE had agreed in its plea deal to pay up to $1.2 million in fines over its sanctions violations. It was up to $1.2 billion.